Among those who made sorties toward Okinawa from Army air bases in Kyūshū, there were few fathers who volunteered to make special (suicide) attacks. Captain Kuno was one of these men. On May 23, 1945, the eve of his sortie, he wrote his final letter all in katakana  to his 5-year-old son Masanori and his 2-year-old daughter Kiyoko who he was leaving behind. A child learns katakana in the lower grades of elementary school. Even though you cannot see me, I will always be watching you. Obey Mother, and do not trouble her. When you grow up, follow a path you like and grow to be fine Japanese persons. Do not envy the father of others, since I will become a spirit and closely watch over you two. Both of you, study hard and help out Mother with work. I cannot be your horse to ride, but you two be good friends. I am an energetic person who flew a large bomber and finished off all the enemy. Please be persons who rise above me and so avenge my death. His wife Chiyoko received this letter and soon gave birth to their second daughter Masae on October 18, 1945. He did not know that she was pregnant with their third child. During the period of confusion after the end of the war, Chiyoko worked as an elementary school janitor in order to support her three children. When Masae become six, her mother told her three children for the first time the story of their father dying during the war and showed them his final letter. She said, "Your father left this for you." 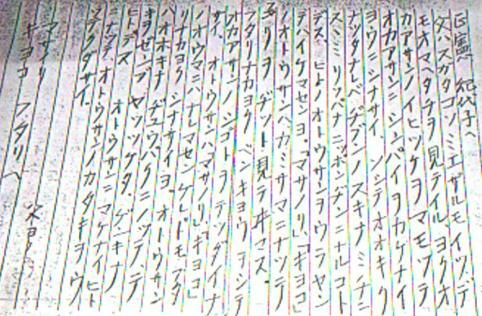 Masanori, who at the time was a sixth grader in elementary school, looked at the letter in katakana and laughed as he said, "It looks just like a telegram." Chiyoko brought up her three children all by herself, and they now each have families of their own. Masanori (age 49)  works at the NTT Nagoya Branch Office, and Chiyoko lives with his family. The oldest daughter Kiyoko (46) lives in Fujisawa City, Kanagawa Prefecture, and the youngest daughter Masae (43) is in Nagoya. Sometimes when their families get together, they talk about their father. Chiyoko says, "Even if he had not gone as a special attack pilot, there were many things he could have done to serve his country, and he was a great husband." In September 1985, Masanori for the first time visited Chiran, where his father spent his final night. He saw his father's photo displayed at the Chiran Peace Museum for Kamikaze Pilots. 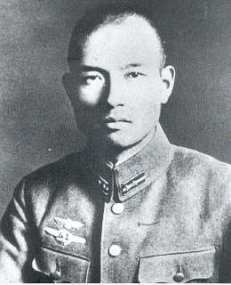 Tadamasa Itatsu (resident now of Inuyama City, Aichi Prefecture), museum director at the time and a surviving kamikaze pilot, saw Masanori, the living image of the photo. Itatsu said to Masanori, "You must be his son." In the early evening of May 24, 1945, Captain Masanobu Kuno took off from Kengun Airfield in Kumamoto Prefecture and died in a special (suicide) attack at the age of 29. He was a member of the 3rd Dokuritsu Hikōtai (Independent Air Squadron), which carried commandos of the Giretsu Airborne Unit in twelve Type 97 Heavy Bombers (Allied code name of Sally). Eight aircraft headed toward Okinawa's Yomitan (Yontan) Airfield, and the destination for four aircraft was Kadena Airfield. The entire operation included 136 commandos of the Giretsu Airborne Unit and 32 pilots and other aircraft crewmen from the 3rd Dokuritsu Hikōtai (Independent Air Squadron). Four of twelve aircraft had to return and make forced landings due to engine trouble or other reasons. Only five of the remaining planes reached Yomitan, and only one of these successfully landed with the others crashing. The commandos in this one plane destroyed American planes and supplies at Yomitan Airfield until they were killed. After Kuno's death in a special attack, he received a promotion to Lieutenant Colonel. He was from Aichi Prefecture and was in the 22nd Class of the Army's Second Lieutenant Cadets. The story and letter are a translation of Asahi Shimbun (1990, 97-8). The biographical information in the last paragraph come from Chiran Tokkō Irei Kenshō Kai (2005, 131, 187). 1. Katakana is one of two kinds of scripts used for Japanese syllabary writing (i.e., each character represents one syllable). Katakana is primarily used to write words that were originally foreign but now have been incorporated into Japanese. Also, as mentioned in the story, telegrams used to be written in katakana. Japanese children learn katakana at a young age. 2. Ages are those when this article was originally published in the Asahi Shimbun in late 1988. Asahi Shimbun Seibu Honsha. 1990. Sora no kanata ni (To distant skies). Fukuoka: Ashishobō.